Appreciating and experiencing works of art have become more and more accessible. Museums and galleries, that exhibit the works of artists from various nations in intervals of every few months, are popular tourist sites and collaborations between art and commercial products are flourishing the general market. Though art has become a very close part of our lives, the actual decision to possess a piece may seem a foreign procedure to many. 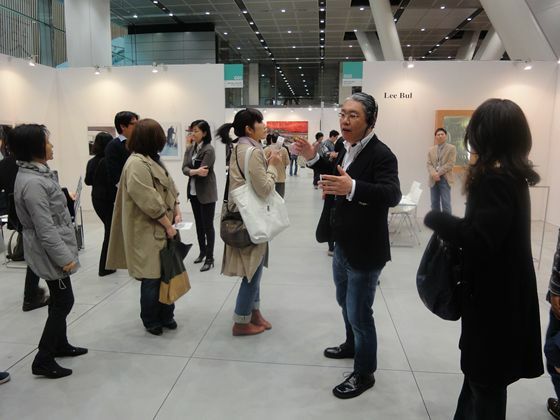 Art Fair Tokyo is an opportunity for anybody to “shop” for art pieces. 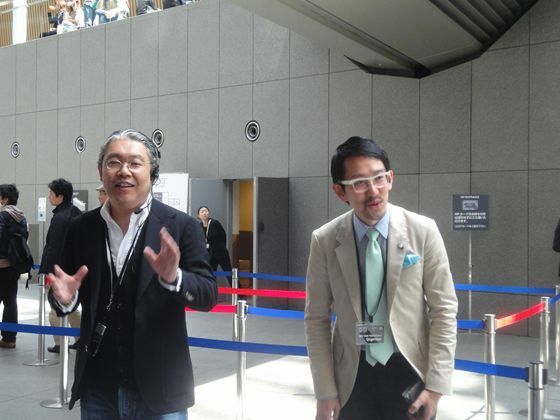 On this day, “business man collector” Daisuke Miyatsu, a business man who owns a collection of over 300 pieces, going as far to build his private home collaborating with artists, enlightened us with personal tips for enjoying Art Fair Tokyo through a guided tour of several gallery booths. 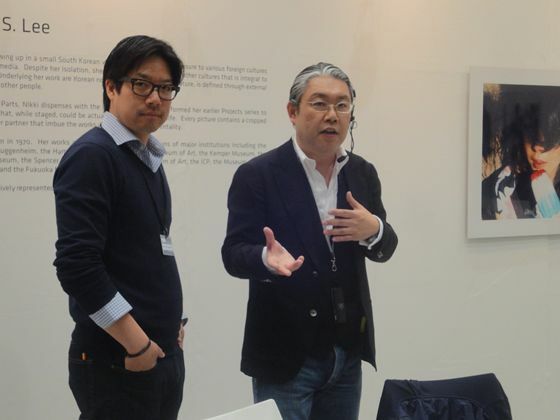 Miyatsu spoke to us that Art Fair Tokyo distinguishes itself from the multitudes of art fairs around the world, exhibiting collections of various genres from traditional paintings to mixed media and time periods that range from antiques to the contemporary. At our first stop, we had been exposed to the antiques of Uragami Sokyu-do. At Sokyu-do from Japan. 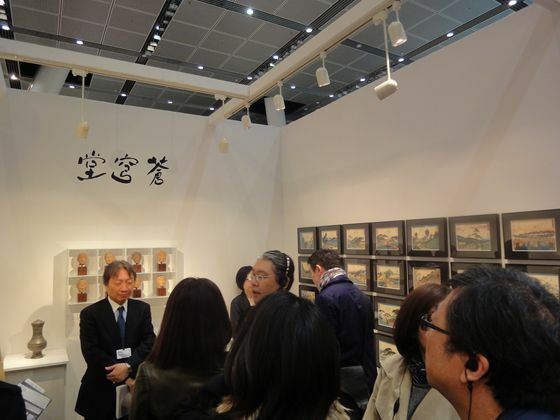 The exhibit is composed of Japanese “ukiyo-e” (wood block prints), notoriously popular world wide and Chinese decor and terra cotta statues of soldiers, crafted under the belief that the deceased are able to lead a wealthy afterlife. 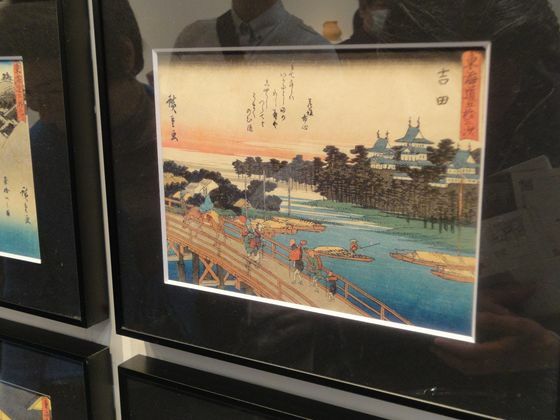 The ukiyo-e prints of various Japanese sites, printed in 1840 by Hiroshige Utagawa, are well beyond famous, but medium size prints (7.9in x 11.8in / 20cm ×30cm) can be acquired at an affordable price range of approximately $300 to $500. Actually, all of them were sold out at that time. 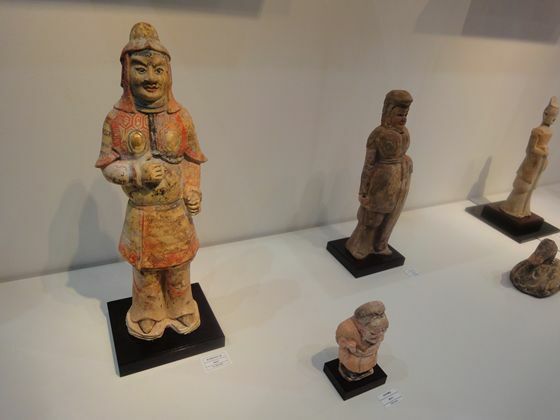 According to the gallerist, although some of the collections are from the Han dynasty, it is desirable that the viewer admire works simply for their beauty and unique form and not for their age. However, the accessibility to these antiques, that have survived a long history, is another compelling aspect of this fair. 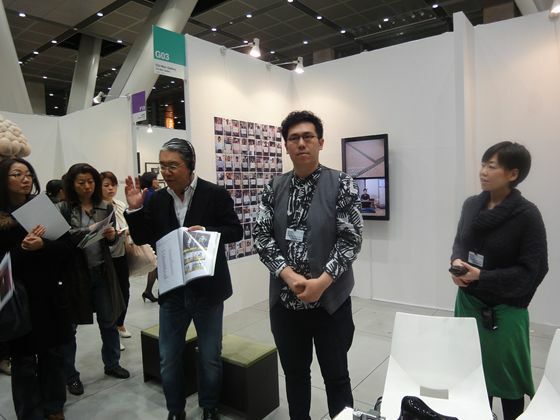 Miyatsu said another characteristic of Art Fair Tokyo is that the fair also focuses on exhibiting contemporary art works of artists from all over Asia. Such countries include Japan, China, Korea, Taiwan, countries of the Asian pacific region, etc. 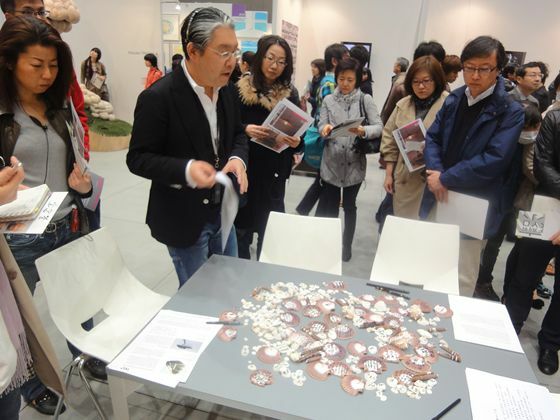 In the Korean and Taiwanese booths, Miyatsu guided us to witness the various works of renowned young artists, such as those whom have exhibited their works at the Venice Biennale or have there works housed in national galleries of their home countries. One And J. 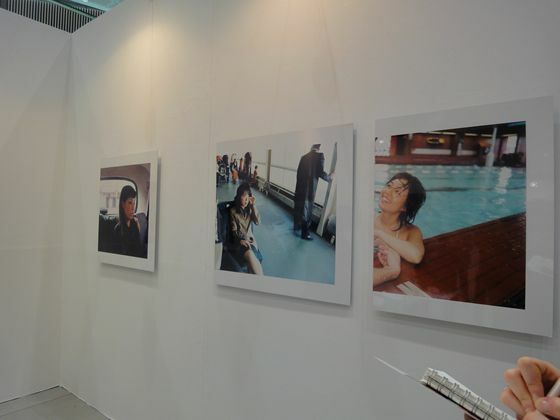 Gallery, from Korea showing photographs by Nikki S. Lee. Miyatsu also mentioned that the increase in the new generation of artists whom have traveled abroad to the west to pursue an education in the arts. And the Asian galleries have ventured forth to support them. TKG+, Taiwan and China. 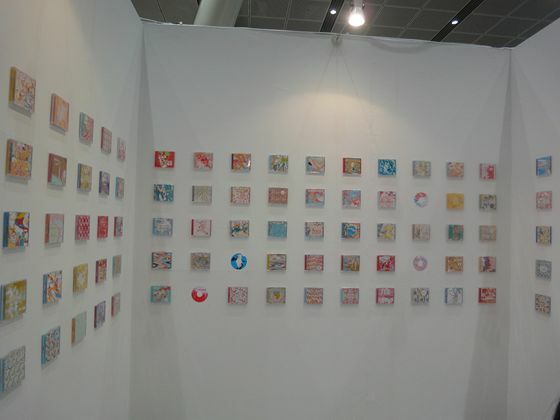 Works by Charwei Tsai. Viewers write mantra on the shells. Miyatsu showing the artwork book by Donghyun Son. It is titled “Portrait of the king” and the kings are Michel Jackson from the young to old. As a Japanese collector, what Miyatsu enjoys through the creations of neighboring countries, is to discover the similarities and differences between their cultures and the cultures of Japan. For example, in some, we can find motifs influenced by Japanimation while in others the traditions of the artists’ home country are melded with modern themes, all the while maintaining the strong link to the roots of Asia. The varying themes allow the viewer to reevaluate the differences in historical and political backgrounds, as well as differences in the current society of each country the artists represents. Visitors may make new discoveries of Japanese arts, through comparisons of works by artists native to neighboring countries. 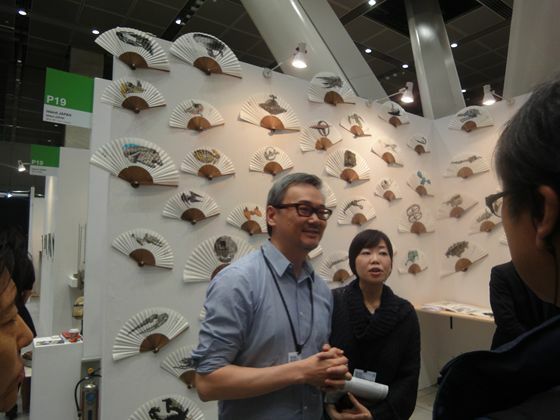 Chi-wen Gallery from Taiwan, with Mr. YU Cheng-Ta, winner of the Bacon prize which is an award of Art Fair Tokyo. Art Work of YU Cheng-ta. 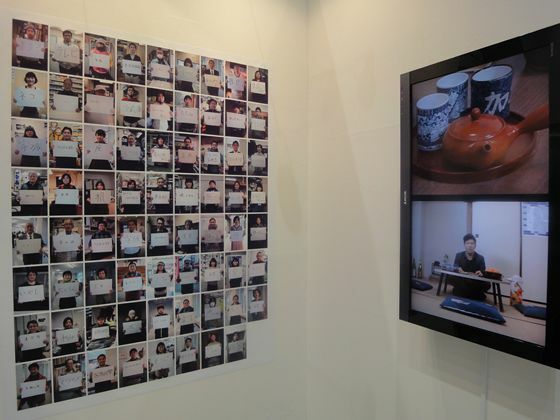 He stayed in Tokyo and asked people what they remind from the word of “i-ma (居間)” meaning living room (photos on the left). And then, he pronounced each words as he heard with his ear and recorded in a video (on the right). 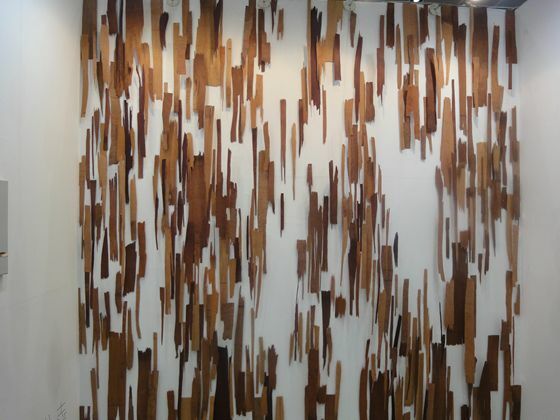 Project in PROJECTS space. 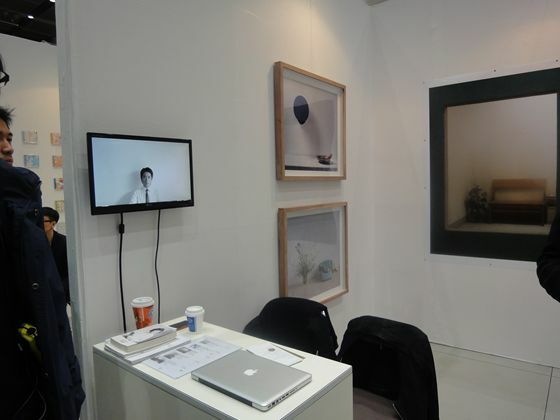 Video works by Chim-pom. 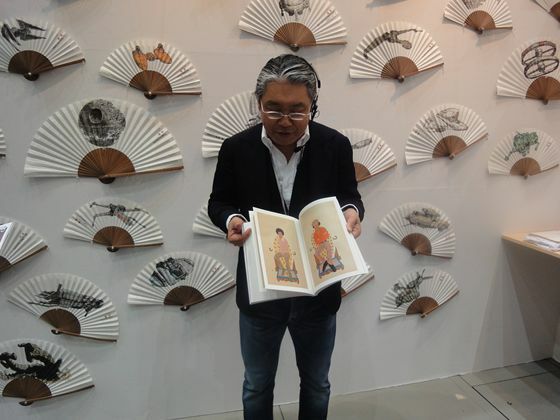 As Miyatsu avidly collects Asian arts, he perceives that Asian art is receiving increased attention and young up and coming artists and galleries are on the rise. In the case of contemporary art, the creators of the works are mostly active, allowing their works to be more familiar to viewers of the same generation, invoking anticipation of the creators’ future works. 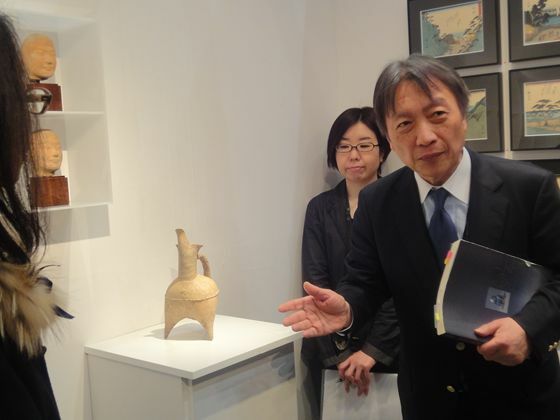 He also suggested us to witness, first hand, the interactions between gallerists and artists,. Through sharing multitudes of information, interaction leads to more interaction, allowing discovery of art works that suit your interests. This could be done easily especially at art fairs. 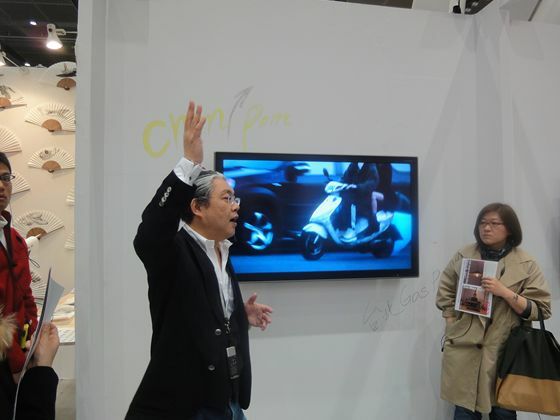 This guided tour covered approximately 10 booths, but I was able to discover various types of arts and artists. I was relieved to find out that gellerists and artists were open to questions and through them I was able to learn of the background of the artworks and the artists’behind them. 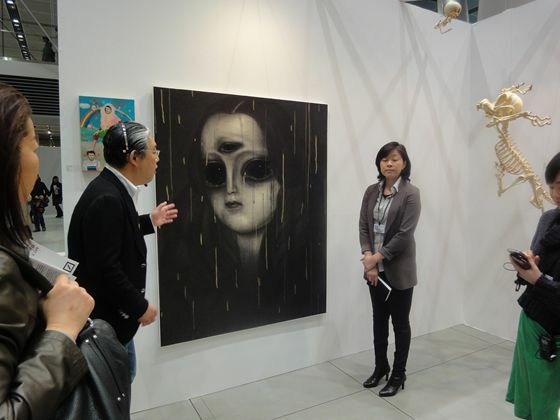 With the annually expanding line up of works, not bound by genre, Art Fair Tokyo is the best place to find a favorite genre of art and/or artist.